Date: Wednesday, 28th May 1975. 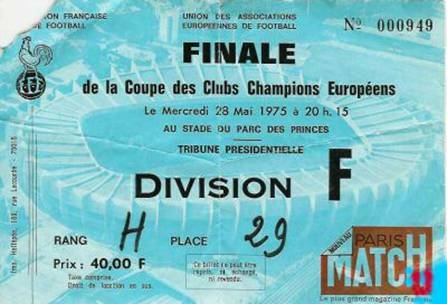 Venue: Parc de Prince, Paris. 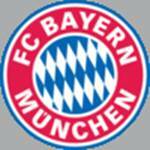 Scorers: Bayern Munich: Roth, Muller. Leeds United: Nil. 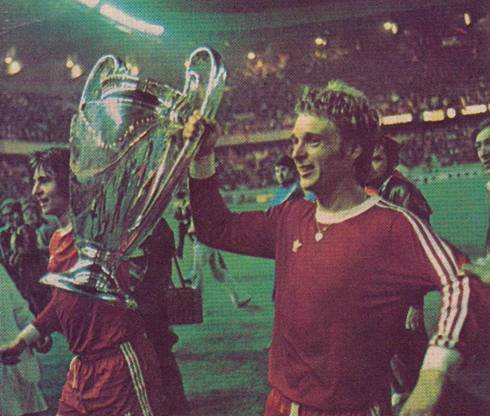 Bayern Munich: Maier; Durnberger, Andersson (Weiss); Schwartzenbecker, Beckenbauer, Roth; Tortensson, Zobel, Muller, Hoeness (Wunder), Kapellmann. 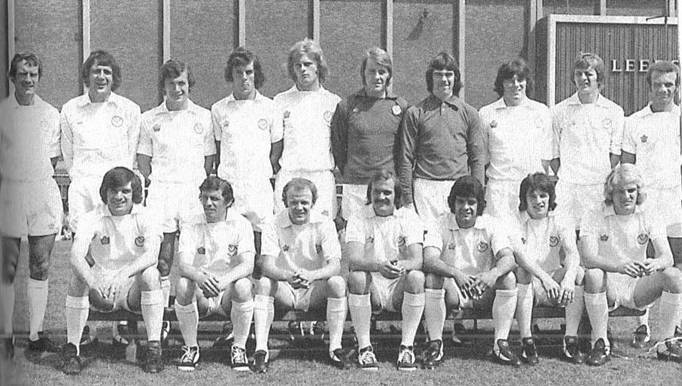 Leeds United: Stewart; Reaney, F.Gray; Bremner, Madeley, Hunter; Lorimer, Clarke, Jordan, Giles, Yorath (E.Gray). 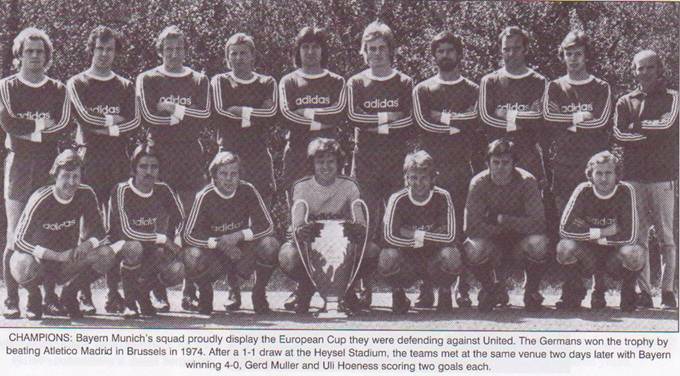 United reached new heights when they lifted the 1973-74 League championship, producing a brand of football which earned them another shot at the European Cup. 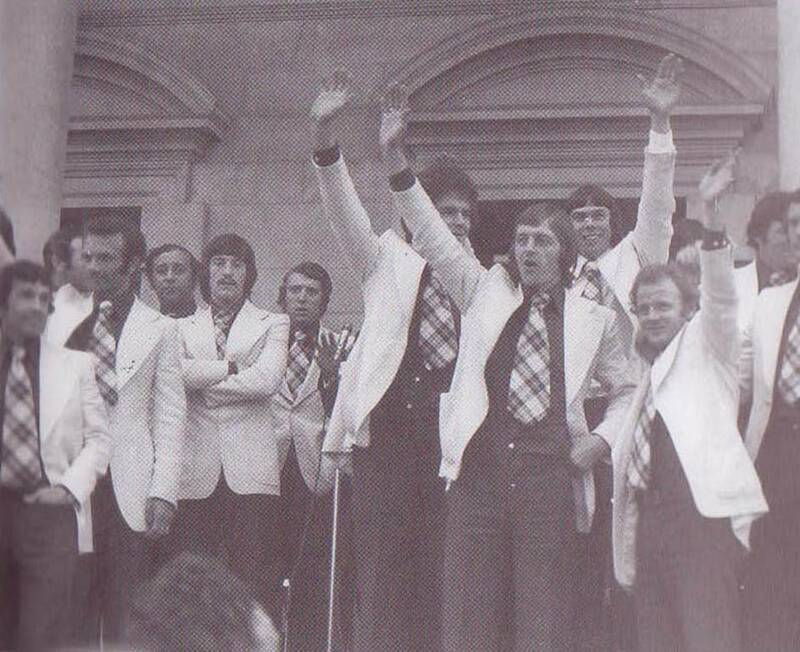 This time they bettered their Semi-Final appearance in 1970. This latest European venture was undertaken without the guidance of Don Revie who was by now England manager. Leeds’ experienced squad were now lead by the calm and influential Jimmy Armfield, who nursed the club through a difficult period after Revie’s departure and Brian Clough’s forty-four days at Elland Road. Armfield extracted some excellent displays from his side during their route to the final. 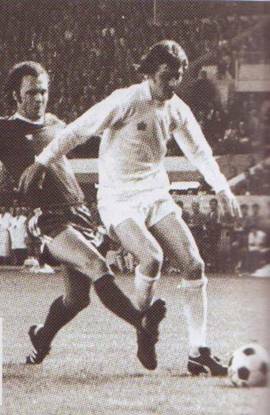 In the Final United were without the towering Gordon McQueen, but Paul Madeley once again showed his versatility to deputise, while on the bright side Johnny Giles was back in midfield and Eddie Gray made the bench. 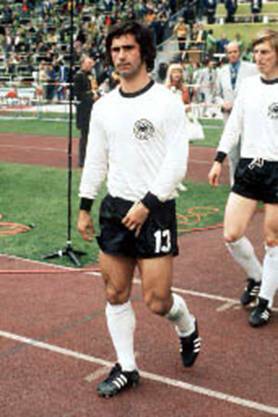 Bayern Munich had their world famous trio of German World Cup players in goalkeeper Sepp Maier, Captain Franz Beckenbauer and goal-machine Gerd Muller, as well as other German Internationals, including Ulli Hoeness, and some Scandinavian Internationals. 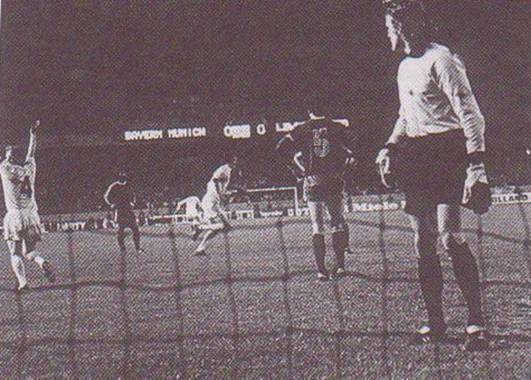 What was to have been the greatest night in Leeds United’s history turned into a nightmare. Despite dominating against a negative Bayern Munich , United’s dreams of taking club football’s greatest prize were blown apart by two late goals. In Paris, luck deserted United in their hour of need. Little went right for Leeds in the match as they claimed, with some justification, that they had suffered at the hands of some poor refereeing, as just two years after the shambolic refereeing by Greek referee Christos Michas in the European Cup-Winners’ Cup Final against AC Milan, Leeds found themselves on the wrong end of more bad decisions. Bayern would probably not have agreed with that synopsis after coming off worst in some brutal early exchanges. 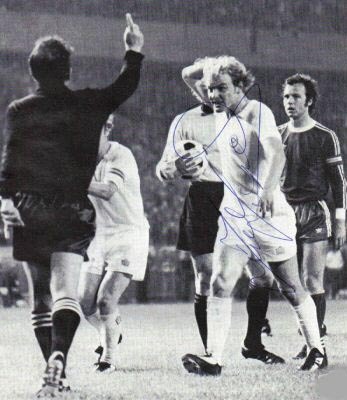 Terry Yorath, whom Manager Jimmy Armfield had picked ahead of Eddie Gray, clattered Bjorn Andersson, just as French referee Michel Kitabdjian blew for a foul against Frank Gray. 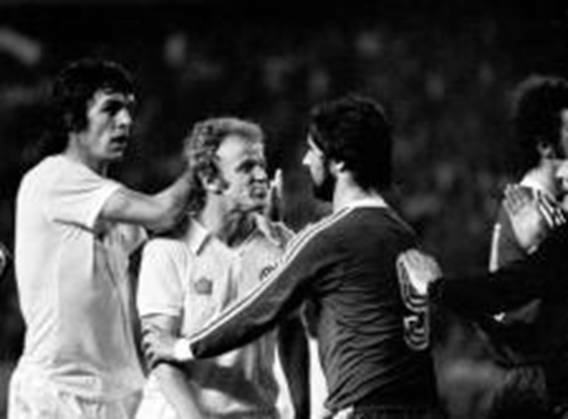 The challenge forced the Swedish International to limp off, to be replaced by Josef Weiss, after just five minutes, but eventually toe-to-toe combat did give way to some football with United the more progressive of the two teams. 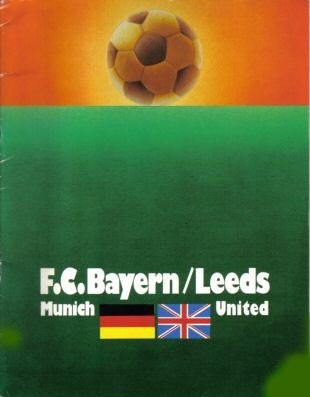 Dominating in the first half, Leeds ran Munich ragged as the holders, who had beaten Athletico Madrid in the previous year’s Final, seemed content to let United come to them. That simply invited trouble and they were lucky to survive two strong penalty appeals. Following close efforts by Norman Hunter and Peter Lorimer, whose long range efforts just whizzed past the post, they had the two penalty appeals rejected. 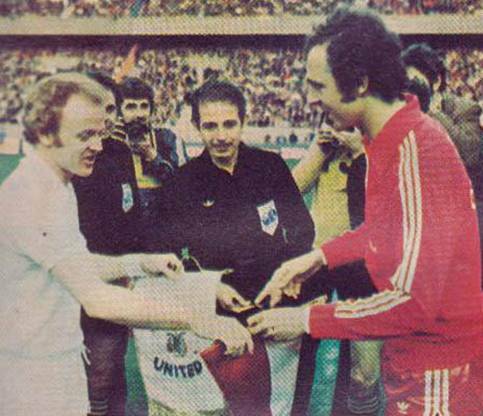 Both involved Munich skipper Franz Beckenbauer, who had led his country to World Cup glory in Munich in the previous summer. 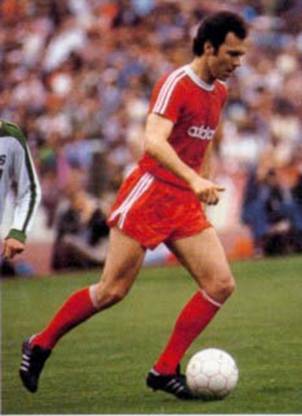 In the first, he seemed to thrust out an arm and handle the ball as he was on his knees with Peter Lorimer taking the ball round him in the penalty area. 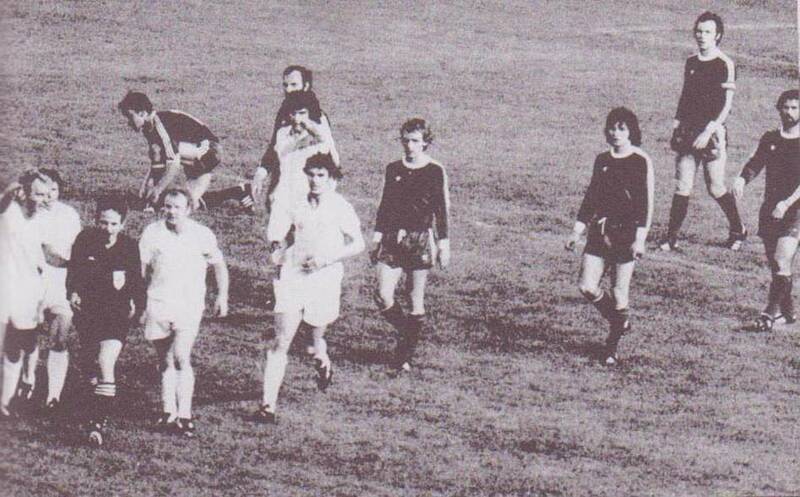 In the second Allan Clarke had his legs whipped from under him by the German Captain two minutes before half-time. Incredibly the referee, who had a clear view and was less than ten yards from the incident, failed to give a penalty, much to United’s disbelief. 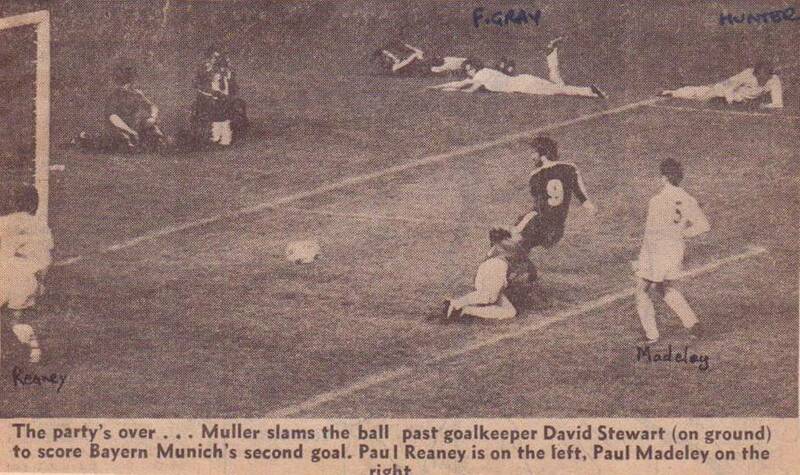 After both the penalty appeals had been turned down, despite their frustration United continued to call the tune while Bayern lost inspirational midfielder Uli Hoeness, who was replaced by Klaus Wunder, three minutes before half-time, after hurting himself when tackling Frank Gray. 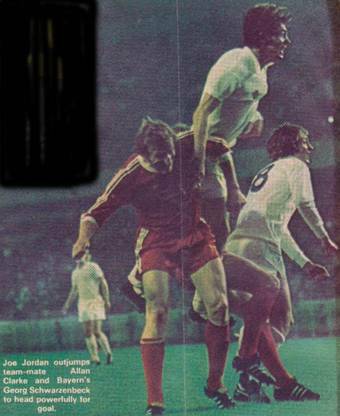 United’s main attacking ploy was to deliver the ball accurately to the head of Joe Jordan, who dominated the aerial challenges. 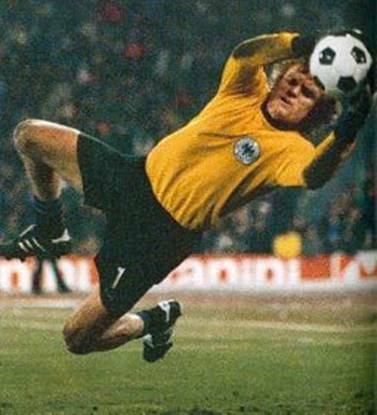 United continued to make chances, but when they did get a sniff at goal they found World Cup winning goalkeeper Sepp Maier in stupendous form. As Joe Jordan skipped away from the Bayern defence and whipped in a right foot shot, the big German keeper made a spectacular leaping catch. 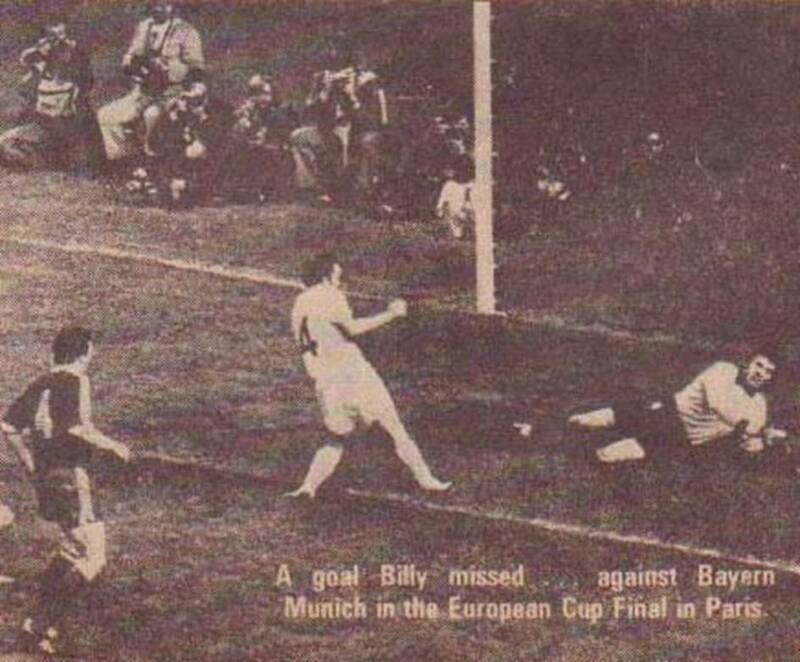 The second half took a similar pattern to the first and United, with Billy Bremner and Johnny Giles running the midfield, continued to press and were frustrated again on the hour mark by the German goalkeeper, Sepp Maier, who denied Billy Bremner with a brilliant point-blank save, as he spread himself to deny the Leeds skipper after Paul Madeley had headed on Peter Lorimer’s free-kick. Then the game turned around dramatically in a matter of minutes, midway through the second half. 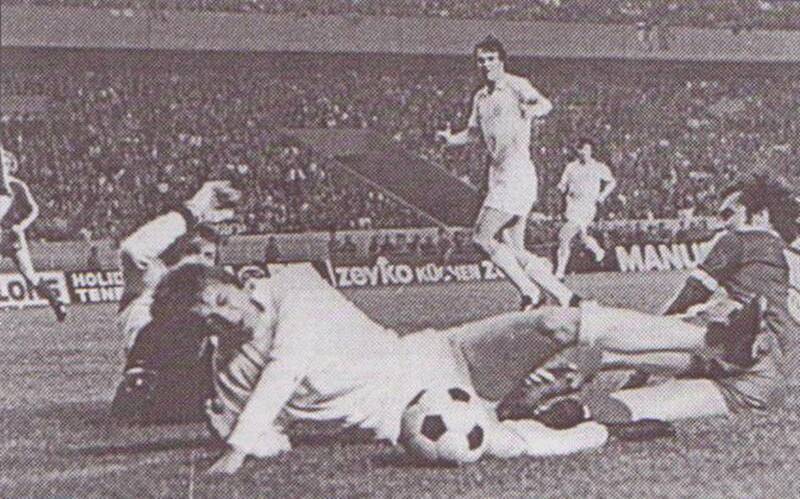 Peter Lorimer thundered a sixty-sixth minute volley past Sepp Maier, only to have the effort disallowed because Billy Bremner had strayed offside, although Leeds claimed that he was not interfering with play. 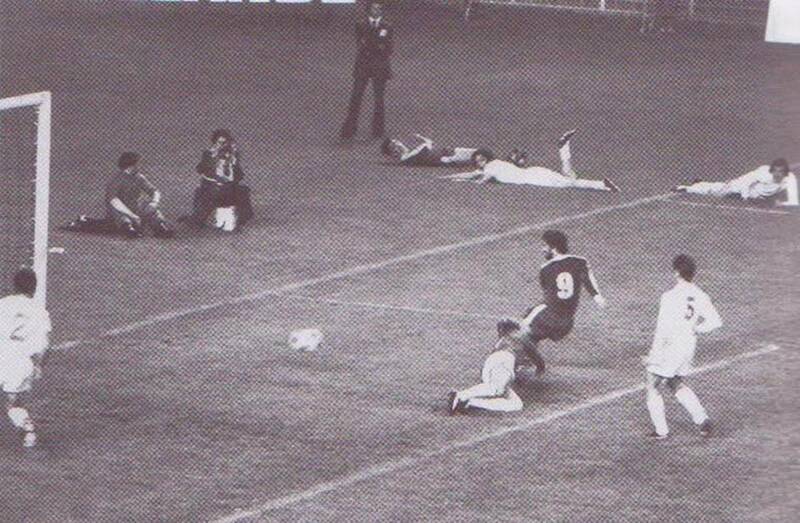 It was even harder to take as the referee had initially awarded a goal, but in the end he allowed the linesman’s opinion to over-rule his initial opinion and the unstoppable Peter Lorimer volley was ruled out. It was a shattering blow and the turning point in the match. 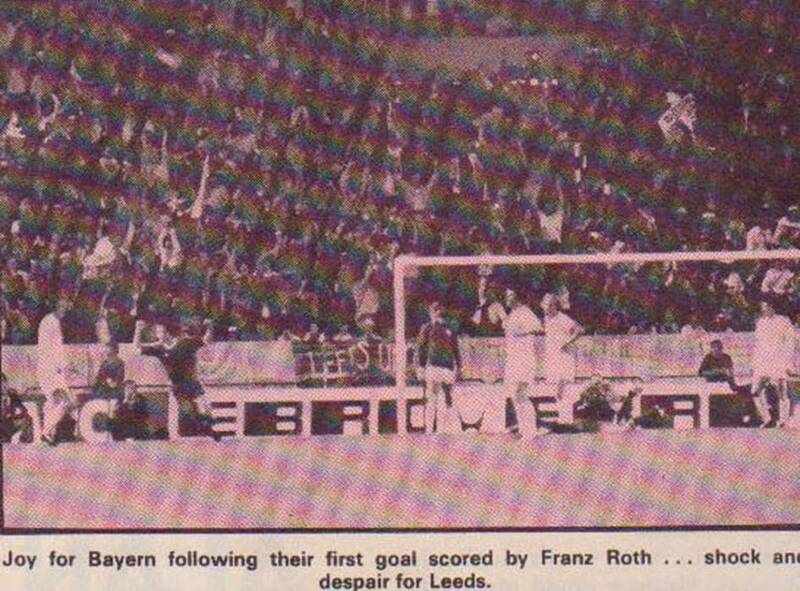 All hell had broken loose at the Leeds end of the all-seater Parc des Prince Stadium behind Maier’s goal. Both the mood and complexion of the match altered minutes later as Bayern took the lead totally against the run of play. 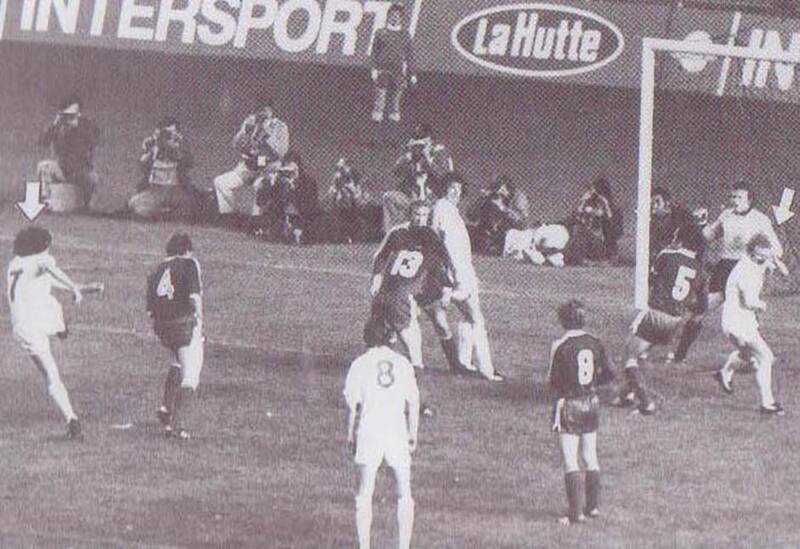 After seventy-one minutes, Danish star Conny Tortensson slipped a neat through ball to Franz Roth, who raced past Paul Madeley and clipped a left-foot shot past the advancing David Stewart and into the left-hand corner of his net. It was a class goal, but totally out of keeping with Bayern’s approach to the game. 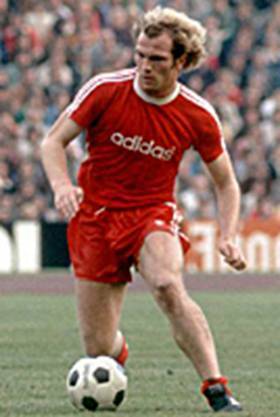 United were broken, eight minutes later Eddie Gray was sent on to replace Terry Yorath but the Scottish star had hardly touched the ball before Bayern doubled theit lead after eighty-one minutes. 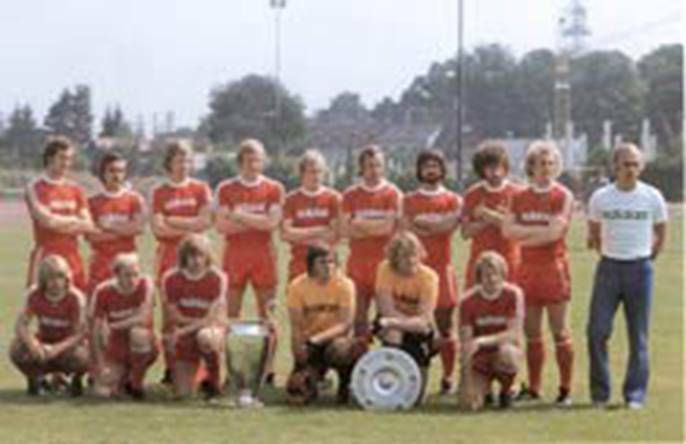 Hans-Josef Kapellmann broke past Norman Hunter and Frank Gray on the right and cut the ball back from the by-line for goal-poacher Gerd Muller, who had barely had a kick all night, to steal in front of Paul Madeley, playing in place of the suspended Gordon McQueen, and turned the ball in at the near post. The smash and grab had been completed, leaving United empty handed from a controversial final for the second time in three years. 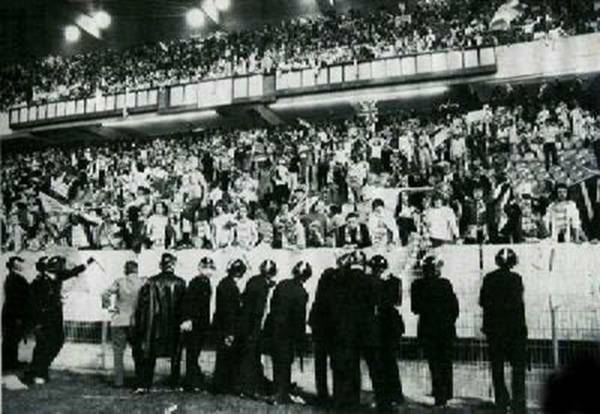 To complete a night of disaster for United, hordes of their 8,000 supporters rioted inside and outside of the ground, actions which cost Leeds a ban from European competition. UEFA initially slapped a four-year ban on United but it was reduced to two years after a well-argued appeal by Manager Jimmy Armfield. 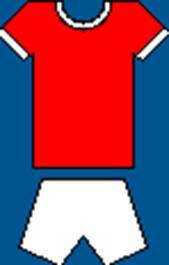 He noted in the programme for the opening game of the following season, “We simply had to appeal over the sentence. I felt, and still do feel, that to hold a football club responsible for the behaviour of its ‘supporters’ outside the jurisdiction of its own ground is morally and legally wrong.” Referee Kiabjian’s display was apparently marked two out of twenty by UEFA, but that was of little consequence or consolation to United, who were now frozen out of Europe. Peter Lorimer later recalled the match. 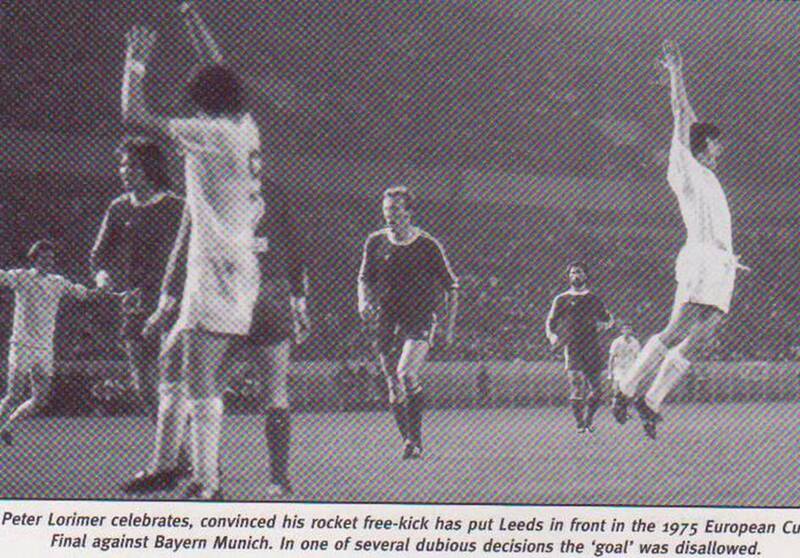 “Leeds dominated the opening exchanges yet were denied an early lead when French referee Michel Kitabdijan waved play on after German international Franz Beckenbauer appeared to up-end Clarke in the Munich box. 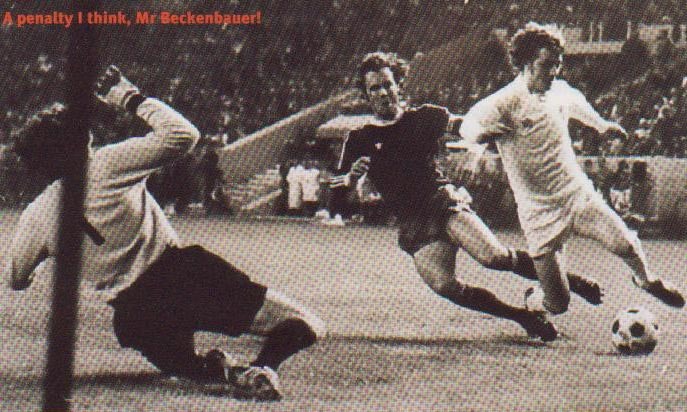 ‘It most certainly was a penalty when Beckenbauer brought me down,’ said Clarke. ‘I saw him fifteen years later when he admitted that we were far and away the better side and, yes, it was a penalty. Fifteen years later you can say that. 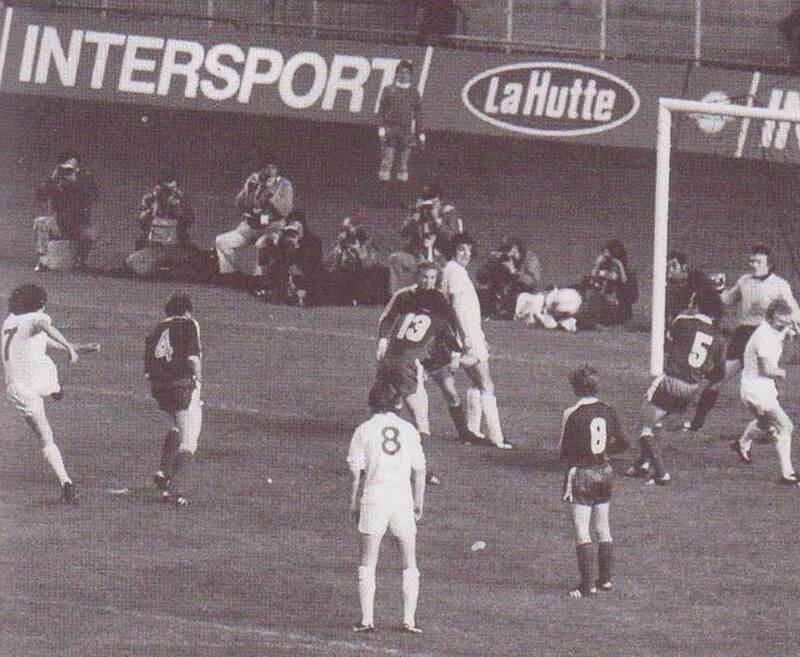 It won't alter the result.’ It was Beckenbauer's first intervention in a game he was to have a dramatic effect on. Leeds controlled the first half and continued to make headway in the second half. 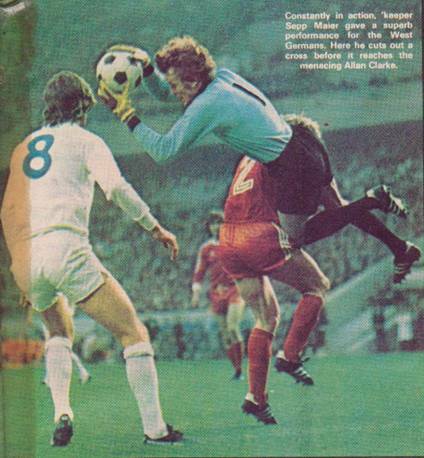 Only the brilliance of German international goalkeeper Sepp Maier kept Leeds at bay...until the sixty-seventh minute. 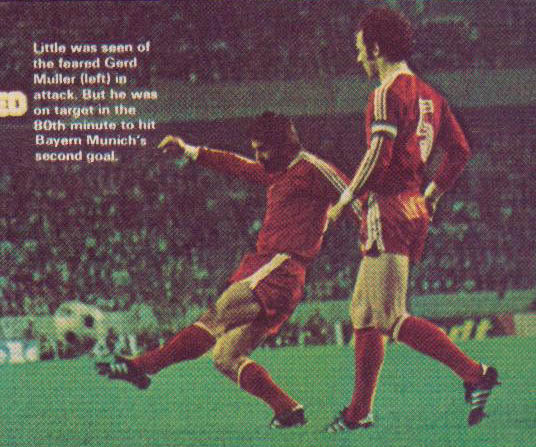 Johnny Giles floated in a free-kick, the Bayern defence failed to clear their lines and Lorimer hammered it home. 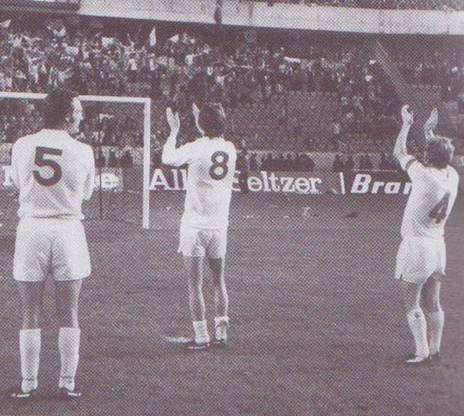 The referee awarded a goal, the players celebrated and the fans went wild, but the Germans protested, claiming Billy Bremner was offside. The officials conferred and United hopes were dashed with an about-turn. 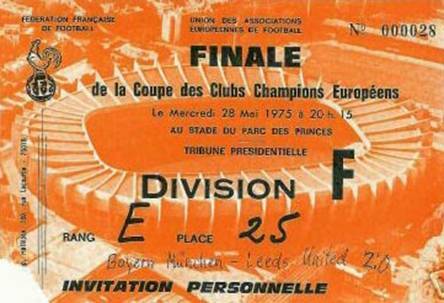 While it was the start of a frustrating era for Leeds fans the European Cup final defeat was the end of an era for the team on the park. Revie's side slowly but surely started to dissolve. It was Giles' last game, Bremner soon moved on, Norman Hunter left, Paul Reaney went and Clarke eventually headed for Barnsley. 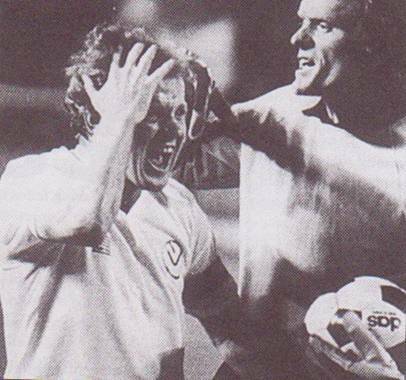 Even Lorimer moved to pastures new before finally returning to boost the club after their relegation in 1982. “I had nine great years at Leeds and winning the European Cup would have been great," added Clarke. 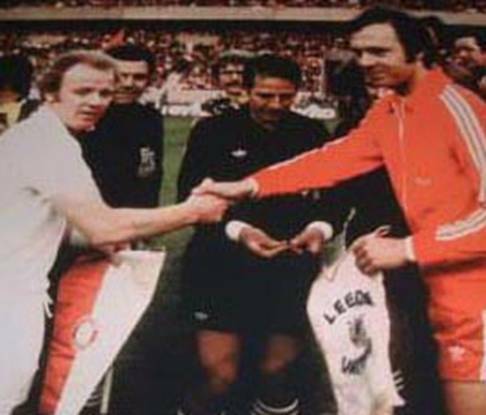 "I still recall other instances, such as the '72 Championship when we were made to play at Wolves 72 hours after the FA Cup final, but I have some great memories of Leeds and always will." 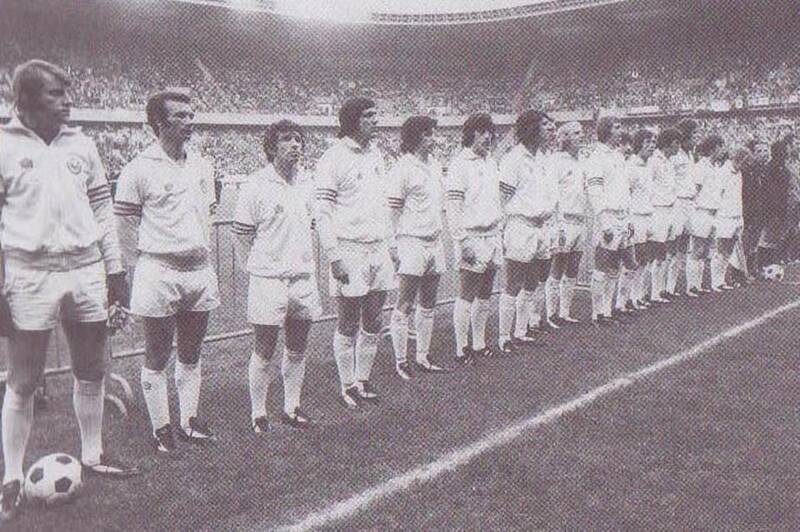 Allan Clarke, Peter Hampton, Peter Hampton, Trevor Cherry, Eddie Gray, Glan Letheran, Duncan McKenzie, Billy Bremner. Allan Clarke, David Harvey, Billy Bremner, Eddie Gray, Paul Madeley. David Stewart, David Harvey, Eddie Gray, Allan Clarke, Paul Reaney.